Remember the good old days when every household had a microfiche reader? Me neither! But, that’s one of the modern advancements this writer thought we would all experience back in 1971. No more need for newspapers, medical records, or anything else to be printed on paper. We’d all have a file of microfiche sheets with everything we needed. Just think of the paperboy (yeah, they still existed in 1971) throwing your envelope of little black x-ray like sheets on your doorstep and in your bushes each morning. You’d grab your cup of coffee, turn on the reader, plop the sheet in the tray…upside down and backwards, of course. Then, you’d get your fill of the daily news before heading off to work. Just think of all the time saved searching for insurance policies or utility bills, too! Everything at your finger tips. I went to work for the public library system back in December of 1981, just ten years after this article was written. It was a work place in transition. The Circulation Department was using dedicated terminals for maintaining the patron checkout system (CLSI). They had a computer system with huge dot matrix printers in a freezing control room spewing out printouts night and day. The equipment took up most of the room. My own department, Cataloging, used a multitude of technology. 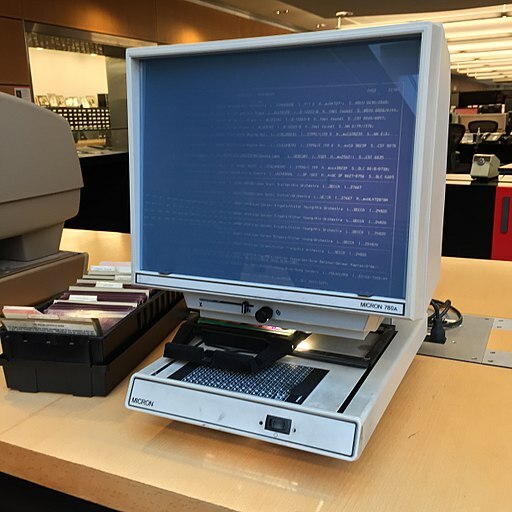 We did our research on the fancy RLIN terminals and had a microfiche reader to look up MARC records not found in RLIN. The card catalog was still on cards but we also had microfilm readers in every branch. I don’t know how many catalog cards I typed up that first year or how many records I input into RLIN. We were a department in flux as we edited records in RLIN and OCR typed sheets. Oh, how I hated that OCR scanning paper and it’s dang blasted typewriter font! Were There Microfiche Readers in the Home? A year or two after I was hired we got our first IBM PCs. It wasn’t long after that we had one in our home. Did we ever get that microfiche reader at home as predicted? No. You could buy them for home use, but I don’t know anyone who owned one. CompuServe was kicking into gear and AOL would soon be on the horizon. With the advent of the world wide web, there was no need for microfiche in your home. I love seeing these predictions of the future. A lot of the technology that was supposed to make our lives easier never quite made it. I’m still waiting for the glow in the dark wall paper from that Disney documentary we watched in elementary school. 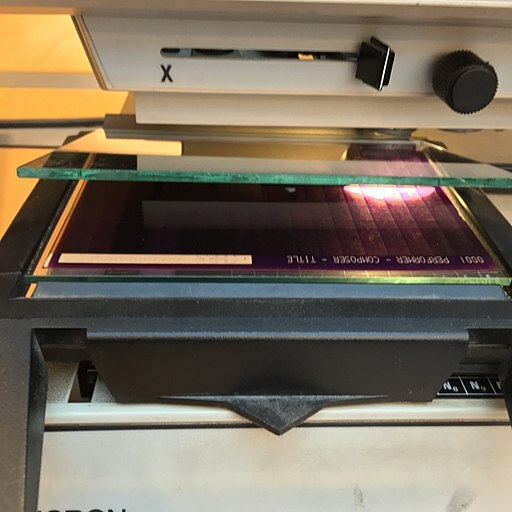 Microfiche which was invented in 1961 by Carl Carlson may have sounded like the next great thing. Who in 1961 could have predicted the shrinking of computer components, the digitization of whole libraries, and the endless possibilities the internet would provide? What? You haven’t seen the glow in the dark star constellations for ceilings in kid’s rooms? I’m pretty sure there’s wallpaper too. I remember when we went from microfilm to microfiche and what a big deal it was. It did make library research easier at the time. Saved so much time! 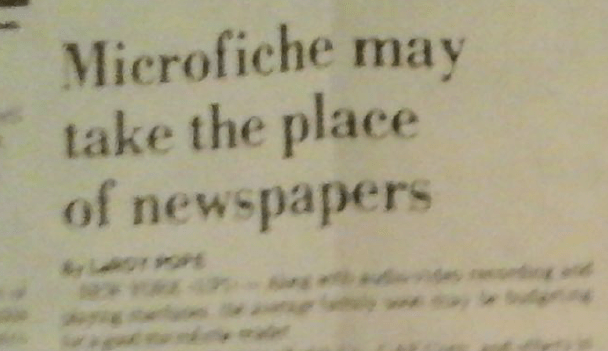 Like you, I get distracted easily when looking at old newspapers. Some of the stories are, well, lively. The political stories? Could have been written today. It’s fun to go through old newspapers. I’ve learned a lot about the times, about the products people used, and what was important to them. Also, they were so much more “newsy”. They covered everything from what kids were doing in elementary school to family birthday parties. They were the lifeline to the community.